The English National Opera is presenting its first staging of Porgy and Bess in the company’s history opening on October 11th. 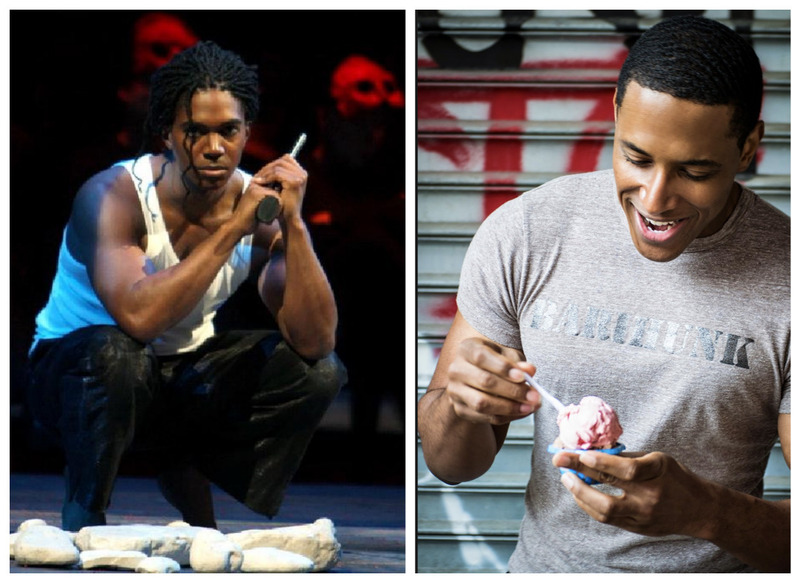 Barihunk Nmon Ford will also be making his company debut as Crown. Also featured will be barihunk Donovan Singletary as Jake. The cast will also include Eric Greene as Porgy, Nicole Cabell as Bess, Latonia Moore and Gweneth-Ann Rand alternating the role of Serena, Nadine Benjamin as Clara, and Frederick Ballentine as Sportin' Life. The 1935 “folk opera” will be presented anew in a realistic and hard-hitting account of life in the African-American communities of the 20th century Deep South. Porgy and Bess tells the story of disabled beggar Porgy and his love for Bess as he tries to rescue her from the influence of her abusive lover Crown. With songs including “Summertime” and “I Got Plenty o’ Nuttin” and “I Loves You Porgy”, material from the opera has been reinterpreted by jazz and popular singers for decades. Performances run through November 14th and tickets and additional cast information is available online. Polish barihunk Hubert Zapiór won the Lieder/Song Prize and $7,000 at the 2018 Gerda Lissner Foundation Competition in New York City. The Gerda Lissner Foundation was created by Gerda Lissner, a Metropolitan Opera subscriber for 77 years with the mission of providing young opera singers with the financial support they need to pursue their craft and excel in the world of opera. Upcoming performances for Zapiór include Mendelssohn's Elijah at Paul Recital Hall at Juilliard on October 15th and Britten's War Requiem with the Albany Symphony on November 10th. He returns to his native Poland on December 14th to sing Papageno in Mozart's Die Zauberflöte at the Teatr Wieki. 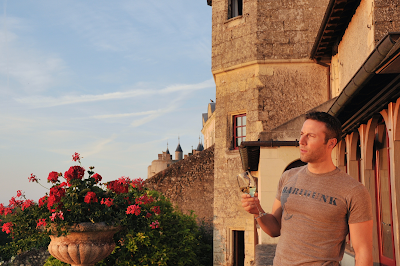 Jonathan Estabrooks, who appeared in the very first Barihunks calendar, will be appearing in the world premiere of Edward Thomas and Joseph Masteroff's opera Anna Christie. The Juilliard-trained singer and producer, who continues to look better with each passing year, will take on the role of Mat Burke, the stoker who falls in love with the title character. The opera will be presented by Encompass New Opera Theatre in New York on October 4 and will run through October 21, 2018 at the Baruch Performing Arts Center. The cast includes also includes Frank Basile as Chris Christopherson, Melanie Long as Anna Christie, Joy Hermalyn as Marthy Owen and Mike Pirozzi as Larry the Bartender. Anna Christie, based on Eugene O'Neill's Pulitzer Prize-winning play explores the lost relationship of a woman and her father, and the sailor she falls in love with. The sea is a powerful symbol in the play and O'Neill having lived by the docks in New York City's waterfront, was acquainted with the sailors, booze, saloons and night life that he wrote about with such passion and authenticity. Abandoned by her father when she was five years old, Anna suffered a life of hardship and carries a dark secret from her past. An emotionally charged reunion with her father, a captain of a coal barge, intensifies when a merchant sailor is pulled from the cold, dark waters of the Atlantic on a foggy night. When the fog clears, Anna, the sailor and her father are caught in a riveting struggle between love and the sea, changing their lives forever. The play made its Broadway debut at the Vanderbilt Theatre on November 2, 1921 and was made into a 1930 Hollywood film starring Greta Garbo in her first talking picture. American Bass-barihunk Evan Hughes whose photos as Somnus in the Komische Oper of Handel's Semele were quite popular with our readers, will be making his San Diego Opera debut on October 20. Hughes will be replacing Nicholas Brownlee as Figaro in Mozart's The Marriage of Figaro. The cast will include fellow barihunk John Moore as the Count, Caitlin Lynch as the Countess, Sarah Shafer as Susanna, Emily Fons as Cherubino and the legendary mezzo-soprano Sussanne Mentzer as Marcellina. Additional performances are on October 23, 26 and 28 and tickets are available online. The Southern California native will also be making debuts this season with Opera Philadelphia as Theseus in Britten’s A Midsummer Night’s Dream, the Bolshoi Theater as Astolfo in Vivaldi’s Orlando Furioso and at the Aldeburgh Festival. 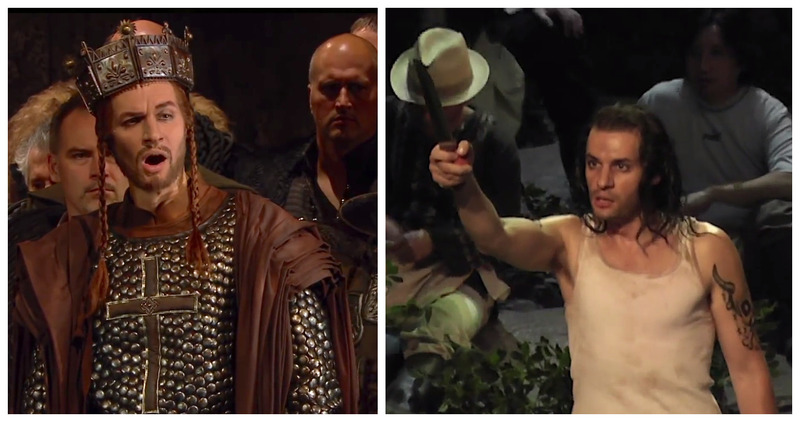 You can watch Hungarian barihunk Marcell Bakonyi as the King of Hungary online at OperaVision in Ferenc Erkel's Bánk bán, which is considered the national opera of the country. The tragic story of has not left the repertoire in Hungary since it was first performed in 1861. It’s performed regularly on national holidays, often with school kids in the audience. The opera includes two amazing arias for the baritone leads, Bánk bán and the King of Hungary, as well as the obligatory soprano mad scene from the era. The main storyline is based on the assassination of Queen Gertrúd, wife of Andrew II in 1213. Composer Ferenc Erkel is barely known outside Hungary, where he’s revered as the father of Hungarian music and the composer of the country’s national anthem. The opera is rarely heard outside of Hungary because it's hard to find singers who can sing in Hungarian. Marcell Bakonyi has not been featured on our site before, but his aria is a tour de force, which is worth hearing. Marcell studied voice at the Leo-Weiner Conservatory of Music in Budapest and at the Hochschule für Musik in Stuttgart, Germany. From 2007-2008 he was a member of the ensemble at Theater Heidelberg, followed by being an ensemble member at the Landestheater Salzburg, where he sang the roles of Bartolo and Figaro in Mozart's Le nozze di Figaro, Kaspar in Weber's Der Freischütz, Angelotti in Puccini's Tosca, Dulcamara in Donizetti's L'elisir d'amore and Leporello Mozart's Don Giovanni. Since 2010, he has been a member of the Ensemble at the Nürnberg State Theater. In 2011, he made his debut as Pietro in Verdi`s Simon Boccanegra at the Budapest State Opera House. Georg Festl created quite a stir with our readers when we introduced him with a shirtless picture back in July. 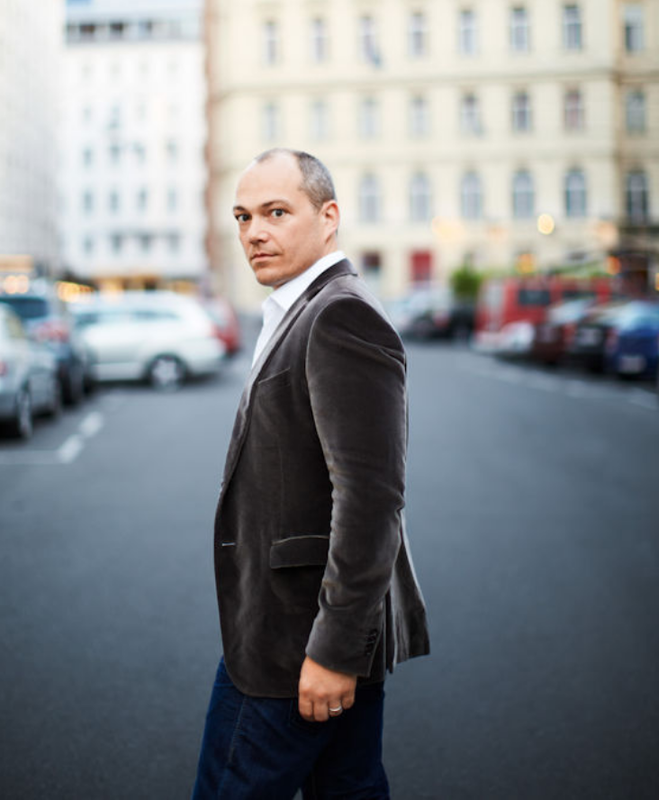 He's now performing the title role in Olivier Messiaen's Saint François d’Assise at the Staatstheater Darmstadt, which runs through October 28th. The cast includes fellow barihunks Julian Orlishausen as Frère Léon and Johannes Seokhoon Moon as Frère Bernard, along with Katharina Persicke as the Angel, Mickael Spadaccini as the Leper, David Lee as Frère Massée, Michael Pegher as Frére Elie and Werner Volker-Meyer as Frére Sylvestre. Tickets are available online. This was Messiaen's only opera and it took him eight years to complete. It premiered at the Paris Opera in 1983 and reflects his devout Catholicism. In searching for a subject, Messiaen pondered dramatizing either Christ's Passion or his Resurrection. Feeling unworthy of either subject, he eventually chose to dramatize the life of Saint Francis of Assisi, which paralleled Christ's chastity, humility, poverty, and suffering. Messiaen also wrote the libretto, consulting Franciscan sources, reading biographies by Thomas of Celano and St. Bonaventure, as well as Francis' own prayers (including Canticle of the Sun). He also cited passages from the Fioretti, Considerations on the Stigmata and the Bible. Festl was born in Nuremberg, Germany and studied English and American studies at the University of Music Würzburg. After graduating, he was cast as Artie Green in Andrew Lloyd Webber’s Sunset Boulevard at the Mainfrankentheater Würzburg. He is a recipient of the Richard-Wagner Society scholarship and the Da-Ponte Society scholarship. From 2015-2017, he sang at the Theater Augsburg, where he performed in Zemlinsky's Der König Kandaules, Verdi's Macbeth, Les contes d’Hoffmann, Die Csárdásfürstin, Lady Macbeth of the Mtsensk District, Tosca and the children's opera Ritter Odilo und der strenge Herr Winter by Mareike Zimmermann. British barihunk Christopher Maltman will sing excerpts from Nico Muhly's opera Marnie at the Guggenheim Museum as part of the Works & Process series, presented jointly with The Metropolitan Opera. He'll be joined by mezzo-soprano Isabel Leonard and director Michael Mayer on Monday, October 1, 2018 at 7:30pm. With a libretto by Nicholas Wright, Marnie is based on the novel by Winston Graham and it examines the cost of freedom, the limitations of forgiveness and the impossibility of escaping the past. Set in 1950s London, the psychological thriller tells the story of a woman who has gone through life embezzling her employers, changing her identity, being forced into a loveless marriage by Okulitch's character, and eventually being forced to confront her past. Leonard and Maltman will sing excerpts from the opera and join in a discussion about the opera. Tickets are available online. Marnie opens at The Met on October 19 and runs through November 10. Also in the cast is Denyce Graves, Iestyn Davies and Janis Kelly. Tickets are available online. You can check out the video taped broadcast of Verdi's Aida from the historic Roman theater in Orange on culturebox with French bass-barihunk Nicolas Courjal as Ramfis. The all-star cast was originally supposed to include Sondra Radvanovsky as Aida, but she withdrew due to fatigue and was replaced by the American soprano Elena O'Connor. The remainder of the cast includes the reigning Amneris of our time, Anita Rachvelishvili. as well as Marcelo Álvarez as Radamès and Quinn Kelsey as Amonasro. You can click HERE to watch the broadcast. Barihunk Marco Vassalli will sing the German premiere of Clint Borzoni's Stufen and Magere Kost on September 9th in Überlingen. The two German language songs were written for the singer and debuted in San Francisco in 2016. The program will also include music by Robert Schumann, Samuel Barber and the Überlingen-based composer Justus Hermann Wetzel. He'll be accompanied by Florian Appel on the piano. The concert will be at the Stadtisches Museum Uberlingen and tickets are available online. The first song is based on Hermann Hesse's Stufen and the second text Margere Kost is by the contemporary poet Hilde Domin. These are the first German language texts set by Borzoni. The singer hand selected the poems to be set by the American composer and performed at Vassalli's official U.S. debut. The Borzoni songs were so popular when presented at Musica Marin that the chamber group is presenting the songs again at their upcoming festival, which runs from September 21-23. Tickets and additional information is available online. 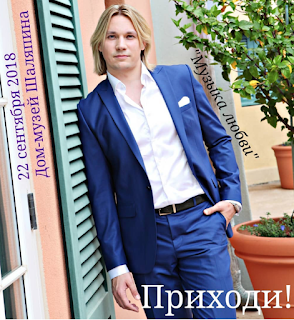 Russian barihunk Oleg Loza will perform a "Music of Love" recital at the Feodor Chaliapin Estate in Moscow on September 22nd, named after the great Russian bass. He will be joined by Natalia Peshekhonova at the piano. The concert is in the Novinsky Boulevard home that Chaliapin bought in 1937, while he was at the height of his powers, and includes his Bechstein grand piano, theatrical costumes, playbills, and posters. Chaliapin and his wife, the Italian ballet dancer Iola Tornagi, hosted some of the greatest figures of the time at their home, including Sergei Rachmaninov, Leonid Sobinov, Maxim Gorky, Ivan Bunin, Konstantin Korovin and Konstantin Stanislavsky. The recital will include music by Tchaikovsky, Rachmaninov, Glinka, Dargomyzhsky and Schubert. Tickets are available online. 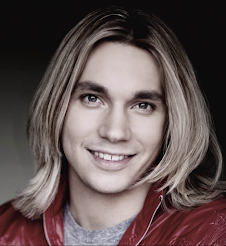 Loza is a former member of the International Opernstudio at Opernhaus Zurich who made his professional debut at the Moscow Conservatoire Opera Theatre.